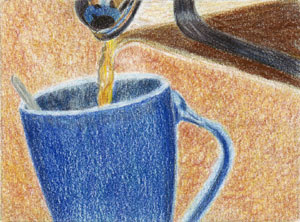 Sherry's Colored Pencil Corner: Illustration Friday - "Gravity"
Ah, helpful gravity, pulling that lovely hot coffee down out of the pot and into my waiting mug... ;-) ACEO size, Polychromos on Rising Bristol White Vellum. Can you imagine being burned by a floating blob of coffee? McDonalds would be sued on a daily basis! Illustration Friday - "Super Hero"